Need some raccoon meat? Head over to Reno’s Seafood (30226 Hwy 51, Akers, LA), just up the road from Middendorf’s, which sells everything from alligator, crabs, and shrimp, with a little raccoon thrown in. Perched on the edge of the highway in the middle of the Manchac swamp, Reno’s sells a little of everything (ice, bait, soft drinks) from a weatherbeaten cinderblock building. 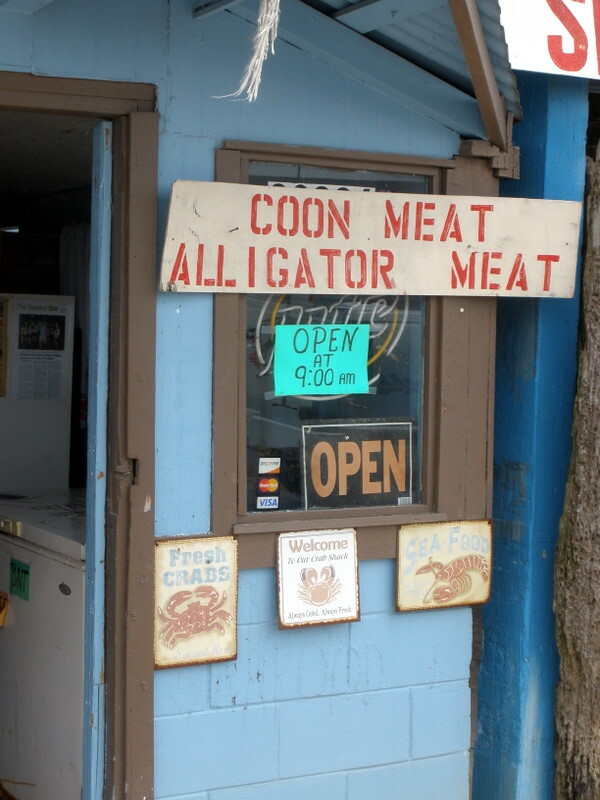 I can understand alligator being categorized as seafood, but raccoon seems to stretch the boundaries a bit, no? I didn’t ask if the raccoon was farmed or wild (sorry). My bet would be that it was farm raised, as in LA it is illegal to sell wild game. I’ve never seen/heard of farmed raccoons; they’re notoriously hard to keep contained as adults. Yes, it is not legal to sell wild game, but certainly it is available on the sly at various places (even in Orleans Parish).